What is it about the Republicans in the Virginia Senate and the day we celebrate the legacy of Dr. Martin Luther King, Jr.? One year ago today, they went for a blatant power grab by attempting to redistrict. Yesterday, although not as insidious as last year’s plan, they did something similar. RICHMOND, VA — This afternoon, Senate Republicans rammed through SB 310, a bill that makes unconstitutional changes to the boundaries of several Senate districts, on a 20-18 party-line vote. SB 310 is patroned by Sen. Jill Holtzman Vogel (R – Fauquier). No provision is made for any off-year adjustment, including the kind of continual changes that Republicans have supported. This is exactly why Democrats Ralph Northam and Mark Herring waited until the last minute possible to resign their seats after being elected LG and AG, respectively. Like I said, this bill isn’t as sweeping as last year’s. However, unlike last year, when Speaker of the House Bill Howell held the amendments made by the Senate to HB 259 as “not germane,” I don’t think that problem exists. I expect this bill to sail through the House of Delegates. If so, it will land on the governor’s desk. 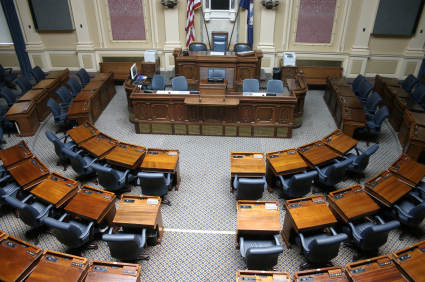 Whether or not McAuliffe vetoes the bill will depend on what else has happened this session by that time. It is possible that he signs it – in exchange for something else, like Medicaid expansion. One thing is certain: never a dull day in Virginia politics. Previous Post Remembering Dr. Martin Luther King, Jr.
Stupid, but blown way out of proportion. You can’t even begin to compare what they tried to pull last time, which redrew the entire state, to moving 25 census blocks between adjacent districts. Unlike our central government, which is only allowed to do those things which the Constitution says it can do, a State government can do anything its Constitution and the US Constitution does not prohibit its doing. Redistricting is REQUIRED in 2011 and every ten years thereafter, but that statute does not prohibit the Commonwealth’s redistricting at other times. The courts disagree with you, Warren. See Little et al v Virginia State Board of Elections. It is clear that “the court finds” with no evidence presented as to where they found the intent of the provision. The court “found” (well, SAID it found) what it wanted. Indeed, this instance was not even relevant to Little, the court threw it is because the court wanted it.